My birthday occurred last week and it was a lovely one, filled with sleeping in, unexpected flowers and jelly beans, Boston-style pizza, and cake made to order. But it started off in the wee hours with the best part. Just after midnight, DH asked me if I wanted to open the first part of my present. "How many parts are there?" I asked curiously. "Three," he replied. After some thought, I agreed and he brought out a promising package, just the right size and shape to fill my heart with anticipation. I quickly unwrapped it and slid it out of its protective clear, plastic slipcase. Beauty. The one I'd been wanting. For ages. "It's a signed, first edition," he said. They all were, as it turned out. And I opened one later that day. And one the following day. 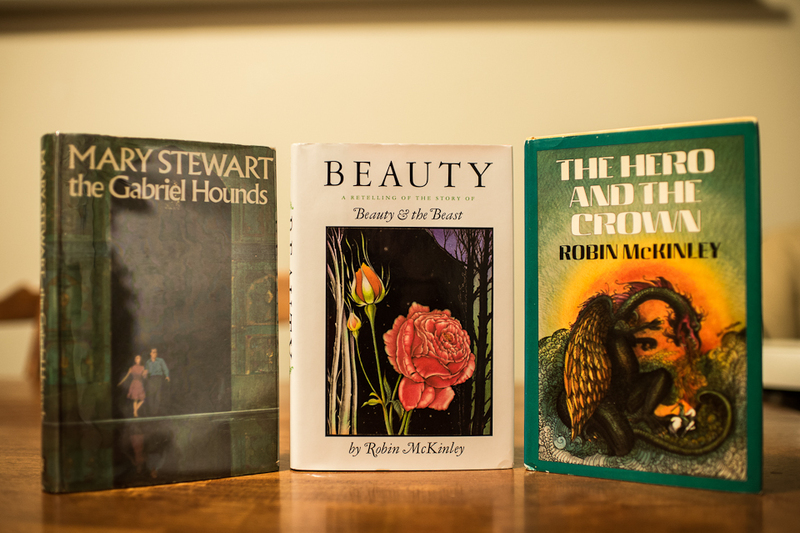 Two Robin McKinleys and a Mary Stewart (Signed! I'd never even seen one of those before.) The boy knows me well, doesn't he? I also received a stack of shiny, new pretties from my parents (Beauty and The Hero and the Crown already stuck in there with their new shelfmates). So as you can see, it was sort of perfect. As my dad has said for years, "We do birthdays well." Wow. Yes, your family does do birthdays well. They win at birthdays. WIN. Happy belated birthday. And might I say I am very envious of those presents! I agree that your family knows how to party! Thanks, Amy. I really appreciate those good wishes. NICE PRESENTS!!! 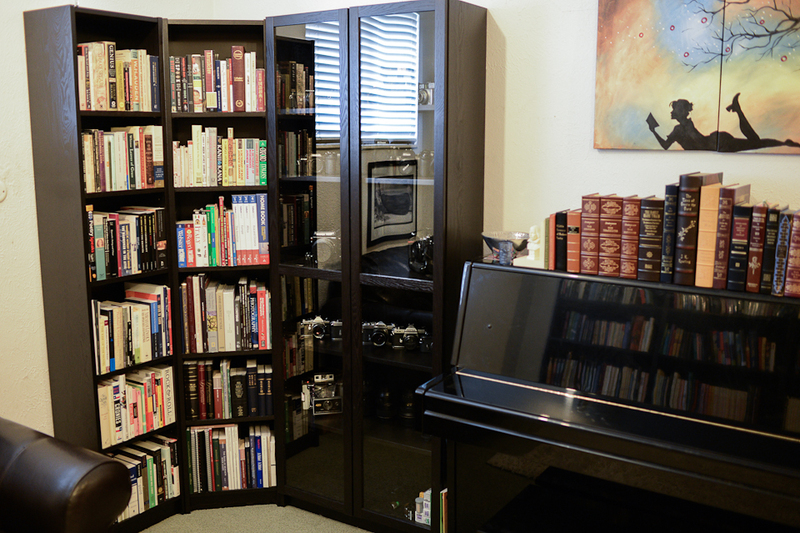 the bookshelves are beautiful, and so are the books! I wish my own birthday were further away from Christmas--I would love book presents in August! It's true, I've always loved having an August birthday. My boy has an early-ish December one and I've always felt bad. Happy birthday! You have an awesome family who know just the kinds of gifts to give you. McKinley! Stewart! First editions! Signed! Cool corner bookshelves! It sounds like a wonderful birthday, perfect for any booklover. They are awesome. I'm a lucky duck. Oh wow. Happy (belated) birthday! What fantastic presents. Glad you had a wonderful birthday! I am incredibly jealous of your first-edition signed Beauty. Beauty's my favorite Robin McKinley story and my favorite Beauty and the Beast retelling of all time. Beauty is incomparable. I always return to it. That sounds like a perfect birthday! Happy Birthday! I got chills reading your post, so I can't even imagine what your reaction was. I just read Gabriel Hounds this summer for the first time. Every time I read a new Mary Stewart book I wonder why I hadn't read it sooner and I get more determined to find another. Speaking of Mary Stewart books, every time I read one I feel like I'm channeling my Dad and your Mom and I picture them as kids reading them. The book shelves are beautiful; I'm glad you had a nice day. love ya! I, of course, love and adore the merlin trilogy (um even though there are 4 books??? maybe 5?? ?....all I know is that I own the triolgy and read the 4th), Anyway, I've also read the Ivy Tree, Nine Coaches Waiting, and now the Gabriel Hounds. After talking to your mom this summer I think Madam Will You Talk is on deck....what next? I don't know what it is about Mary Stewart books, because they don't have to move fast in order to keep my attention like most books that are written today and they don't have steamy love scenes, but they are in and of themselves perfect and classic. I always feel like it's been time well spent after reading a Mary Stewart book. Definitely proceed to Madam, Will You Talk. And after that I highly recommend you read This Rough Magic. You will NOT be disappointed. I think your assessment is spot on. They're just perfect. The writing is so good, she can kind of do whatever she wants at whatever speed she wants and I just sit back and eat it up. What lovely gifts. Glad you had such a lovely day. Thanks, Alexa. I felt the love for sure. Oh your hubby's a keeper alright. Happy Birthday!! Yep, your family does birthdays really, really well. Signed first editions! I wonder where he was able to unearth those? And I love the pretty shelves - it looks good beside the shelves with cameras on display. I have no idea. I'm kind of afraid to ask about the details . . . lol. I love your presents! I also like the photo above the piano! Oh, thanks Laura! It's a painting my husband got me a couple Christmases ago and I love it, too. I realize I'm so very behind here, but belated Happy Birthday, Angie!! Your husband ROCKS and certainly knows you, not to mention your parents and mother in law. So many lovelies (and yeah, I swooned a little at the signed first edition thing). Also I ADORE the painting you have hanging over your piano. There's something about first editions, isn't there? Particularly of books decades or more old. I swoon. I just read my first Robin McKinley books this week -- started with The Blue Sword and Beauty -- they're so good! I know! I couldn't believe it was real. And I wholeheartedly agree. My least favorite Stewart is head and shoulders above most other books! Jennie, I'm delighted you've delved into McKinley. She never lets me down. What good choices you made, too.